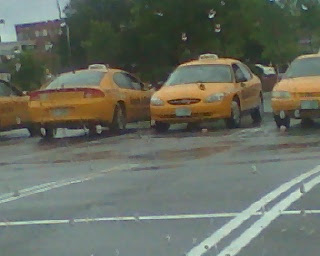 Whenever I go to a certain store, I always see a line of taxi cabs in the parking lot. I guess they use this parking lot as their stopping point. They always seem to be just hanging around. I guess business is slow. Also once again, I didn't have my regular camera. So I snapped this with my cell phone. It was also raining out! Wow, they remind me of school buses! LOL! I'm just checking to see how the comment challenge is going for you this month. Thanks for visiting my blog and the nice comment. haha like a little club! It happens here sometimes too, they will find some places which allow them to park their cabs. Else it can be quite troublesome for them also. Yes because of recession the taxi business has also slow down. I hope soon it be fine as it was before. LOL..that was random. It's crazy how big that picture is from your phone. Have any tips for me? I could not figure out how to get mine bigger. Thanks for visiting my blog. I'm slow getting around with this cold. I was out last week without my camera (horrible). Thank goodness, the cell phone camera worked just fine. I like these cab all lined up. Seems like strange place to settle in at. No mechanic. No dispatcher. Perhaps they know they will get a lot of fares there? Cell phone cameras are so great! ... I use mine all the time. (oops, cap lock) ha haaaaa !!!!!! Ever hear of 'cheese squeeze'?? Its a new stupid game the kids are playing...like when you see a VW Bug car you punch the person? Well with cheese squeeze, you see a yellow car and squeeze the arm of the other person while saying cheeze-squeeze. But that's what this post reminds me of (MY sore arm) lol. Cool Picture, kind of reminds me of the line up in New York City. Nice shot. Reminds me of cabs in Bombay, India. thanks for visiting my post. Hope to see u there soon. Don't you hate when see a great photo moment and you're forced to use your cellphone?! Still turned out great. Reminds me of that song by Joni Mitchell, "a big yellow taxi took away my old man". Very cool. thanks for stopping by my blog.